If you are seeking help because you think you are an alcoholic in need of an Alcohol Abuse Rehab please read the following article. Many rehab centers across the country claim to specialize in Alcohol Abuse. The techniques used in some of these Rehab centers range from medical detoxification, sauna detoxification, counseling, therapy, medications and 12-step methodology. While enrolled in an Alcohol Rehab many people are subjected to mental illness diagnoses, punitive approaches, religious agendas and learned helplessness. For many people seeking Alcohol Abuse Rehab, these types of programs have not worked and have made their situation worse than before. These people are seeking relief from their current lifestyle and they are longing for the tools to change their current set of circumstances. In the hopes that they will find this relief, they check into an Alcohol Abuse Rehab. They soon find the tactics and practices of these Rehabs to be harmful rather than helpful and they still have not gained the tools they need to lead a better life. Here at The Freedom Model Retreats our mission is to provide you with accurate, research-based data to corroborate the statement "treatment doesn't work", "Treatment" meaning conventional Alcohol Rehab. 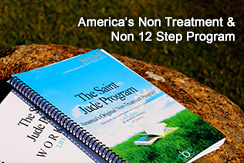 The Freedom Model Program offers an alternative to the methods and practices of these Alcohol Abuse Rehabs. You do not deserve to be treated like you are sick, defective or insane. Here at The Freedom Model Retreats you will always be treated with kindness and respect that far surpasses any Alcohol Rehab - anywhere. You will be afforded new opportunities and experiences and you will gain the tools necessary to lead a long, mature, happy and productive lifestyle. If you or a loved one is in need of Alcohol Abuse Rehab please contact us here at The Freedom Model Retreats.